Photocopies, acrylic, oil pastel, tinted acrylic glaze, polyurethane, brass tacks on cardboard mounted on stretcher strips. 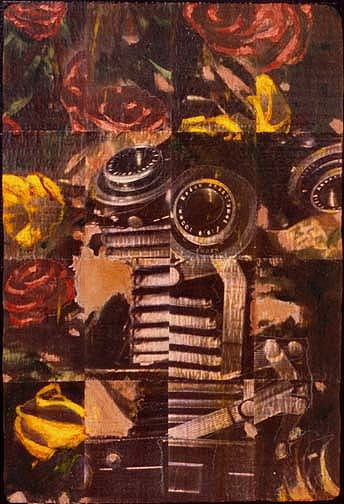 "This piece is composed of macro-lens shots of an antique camera and of plastic flowers a friend bought in India. She gave the flowers to me when I was in the hospital with an eye injury." Please use this link to shop at Amazon.com. A small percentage of the proceeds goes to missionCREEP. Thank you.